Mr. Farrukh Younas Khan is an elected Non-Executive Director of the Board of ISE Towers REIT Management Company Limited. He is the Chief Executive of M/s. Y.S. Stock (Pvt.) Limited, a corporate TREC holder of the Pakistan Stock Exchange Limited. 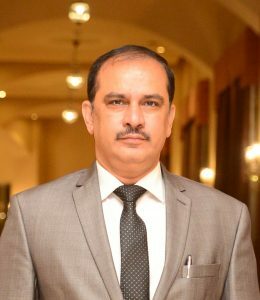 Mr. Farrukh Younas Khan has been in the business of stocks/securities for nearly thirty years, both at Lahore and Islamabad Stock Exchanges. He has been an elected Director of the former Islamabad Stock Exchange thrice. He was also a member of the Demutualization Committee of the Islamabad Stock Exchange. As a member of the said Committee he devotedly participated in the proceedings of the Committee for the corporatization, demutualization and finally integration of ISE. Besides, being a member of the Board of Directors, he is also a member of the HR Committee and the Building Management Committee of ISE Towers REIT Management Company. He is also a Member of Executive Committee of Rawalpindi Chamber of Commerce and Industry (RCCI). He has been a Member of various standing committees of RCCI. He also remained the Chairman of Banking Committee and Law and Order Committee of RCCI. Mr. Farrukh holds vast exposure in the field of administration and Human Resource Management. He has participated in various professional training courses and seminars. He is an effective negotiator and possesses excellent relationship building, interpersonal, organizational, analytical and leadership skills.